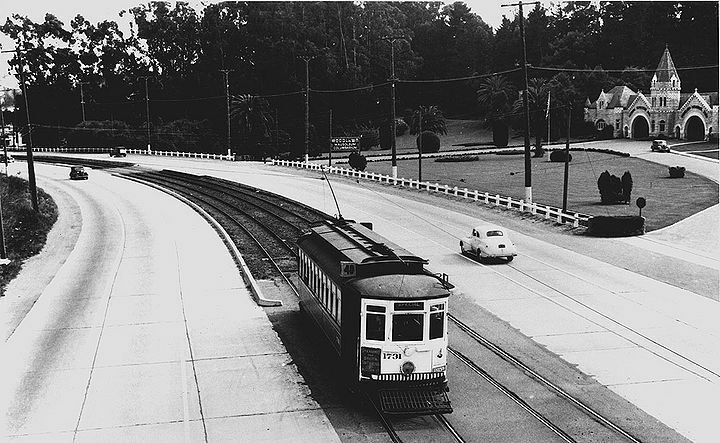 MUNI #40 streetcar northbound on El Camino Real at Woodlawn Cemetery, c. 1947. 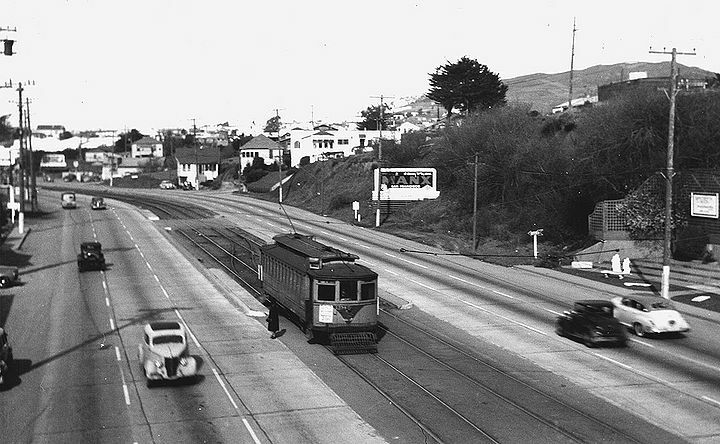 Southbound streetcar from Southern Pacific bridge in Colma, 1947. After the 1906 earthquake, San Franciscans are said to have broken out whatever unbroken champagne bottles remained and raised the toast: Eat, drink, and be merry, for tomorrow we all go to Oakland. Oakland, the target of Gertrude Stein's famous remark that there is no there there, actually ranks somewhat higher in most San Franciscans' estimation than does Daly City, the place that inspired Malvina Reynolds to write her song about little boxes all made out of ticky-tacky. But if Oakland is bad, and Daly City is worse, the ultimate in Deadsville has to be Colma. You want little boxes all made out of ticky tacky? Colma has hundreds of thousands of them, two feet wide and six feet long, laid out end to end in rows that stretch to the horizon like the endless midwestern cornfields so many San Franciscans came here to escape. 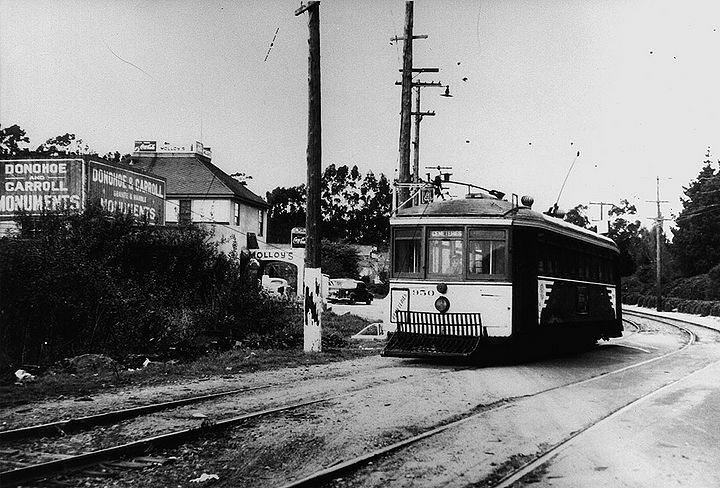 Cemetery streetcar passing Molloy's in Colma across from Holy Cross Cemetery, c. 1940s. Still, Colma is an excellent place to visit, even if you wouldn't want to live there. If you want to drink, drink and be merry, for tomorrow we all go to Colma, an excellent place to begin is in Colma itself, at historic Molloy's Tavern, 1655 Mission Road, an ideal stopping-off point before and after a cemetery visit. (Better designate a driver, or your visit to Colma may be permanent.) Molloy's has Irish coffee to wake the dead, as well as a terrific collection of cemetery-related memorabilia. All sorts of weird pilgrims to Colma stop at Molloy's, including motorcycle gangs who make an annual run to Emperor Norton's grave each summer. 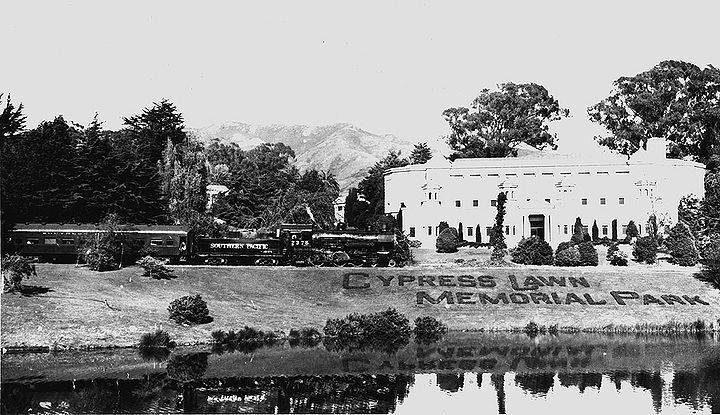 Southern Pacific cemetery train at Cypress Lawn cemetery, no date. 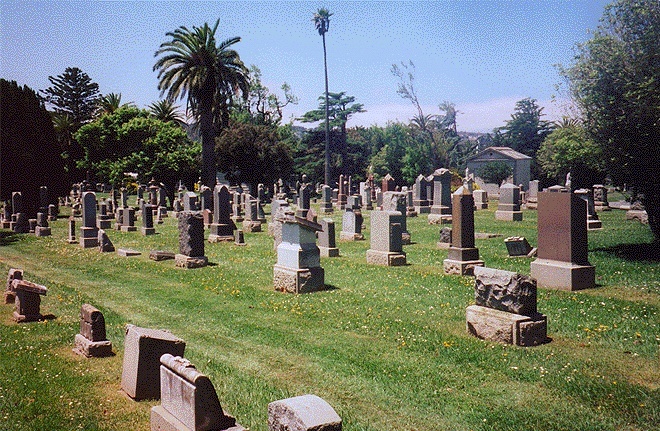 The Cypress Lawn Cemetery in Colma. Cypress Lawn Cemetery: Take 280 south from San Francisco and exit on Route 82. Head south toward Colma on El Camino Real; Cypress Lawn will be on your right. Cypress Lawn is the Bay Area's classiest cemetery. Its overarching trees, castle-style entrance gates, gently sloping lawns, and magnificent monuments make it an ideal picnic site. Some of Cypress Lawn's more prominent Weirde citizens include: Claus Spreckels, the Sugar King on the tiny island between the roads separating areas F, L, and I. William Randolph Hearst, in the Hearst family mausoleum, at the south tip of area H. During the Patty Hearst kidnapping episode the Hearst name was removed from the outside of the mausoleum, though it is still visible inside. 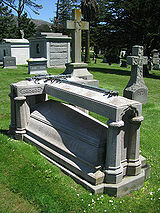 Lillie Hitchcock Coit, the fire queen who incited the erection of Coit Tower, in the small circle between sections M and F. Gertrude Atherton, whose spirit is said to haunt the Atherton Mansion resides in a relatively new mausoleum at the southernmost tip of the cemetery, just northeast of the El Camino Real entrance. To enter the mausoleum you need to know the secret code: Press I and II together, then press V and turn the lever to open. Ms. Atherton may be found in section H, Niche 3, Tier 5. Why did He burn the churches down and save Hotaling’s whiskey? 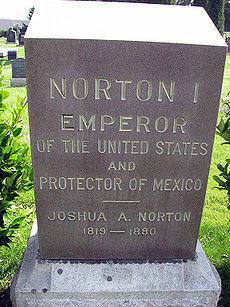 Further into the cemetery, the gravesite of Emperor Norton, San Francisco's all-time bull-goose loonie and number one eccentric. On the northwestern side of Woodlawn you find a monument to the Marine Cooks and Stewards Union and many of its deceased members. A remarkable union for its early commitment to "checkboard" crews to combat racism, they were also known as a haven for homosexuals even before such a category was widely acknowledged. Hills of Eternity and Home of Peace: Two side-by-side Jewish cemeteries. On the Hills of Eternity side: Wyatt Earp of San Francisco by way of Tombstone, Arizona and the O.K. Corral. To find him, follow the road between the two cemeteries to the C. Meyer mausoleum. Follow the path to the Sophia Isaacs boulder, featuring two marble doves reading a book inscribed with Ms. Isaacs' name. Earp is just ahead and to the right of her monument. 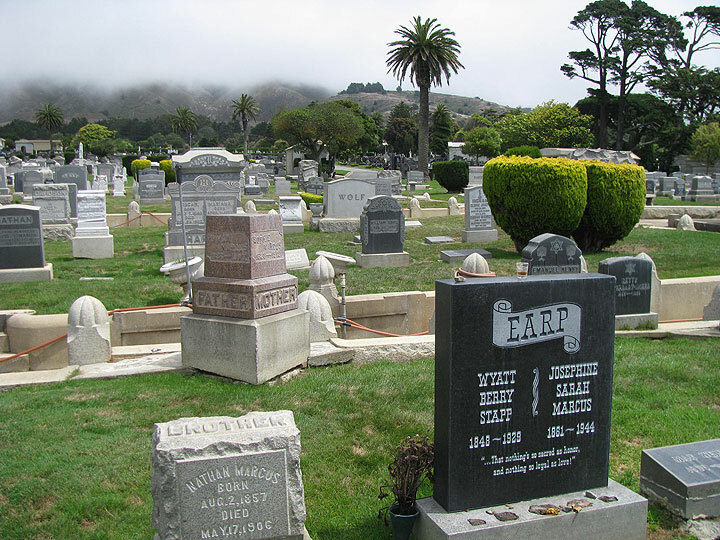 Wyatt Earp grave in Hills of Eternity Jewish Cemetery, Colma. On the Home of Peace Side: Herbert Fleishacker, author of the world's largest ice-cold swimming pool is in the large mausoleum near the front entrance of Home of Peace. The God of Blue Jeans, Levi Strauss, rests in a massive mausoleum located in the same row as Earp's tombstone, but at the far end next to Middle Road. Adolph Sutro and several members of his family, also reside in Home of Peace. Holy Cross Cemetery: The largest of Colma's cemeteries, it's located just southeast of Cypress Lawn, on the other side of Old Mission Road. 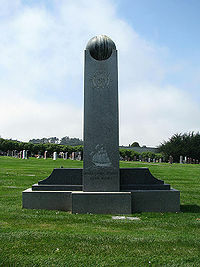 In this cemetery you can find many famous San Franciscans, including former mayor Joe Alioto, famous baseball slugger Joe Dimaggio, San Francisco Chronicle founder Michael De Young, and longtime Catholic priest to the Irish working class Father Peter Yorke, and famous sculpture artist Benny Bufano. Mayor George Moscone, slain by Supervisor Dan White in November, 1978, just a week after the Jonestown massacre, resides here. To find him, locate the statue of St. Michael and the dragon in the middle of section B, and look five rows over toward the entrance. 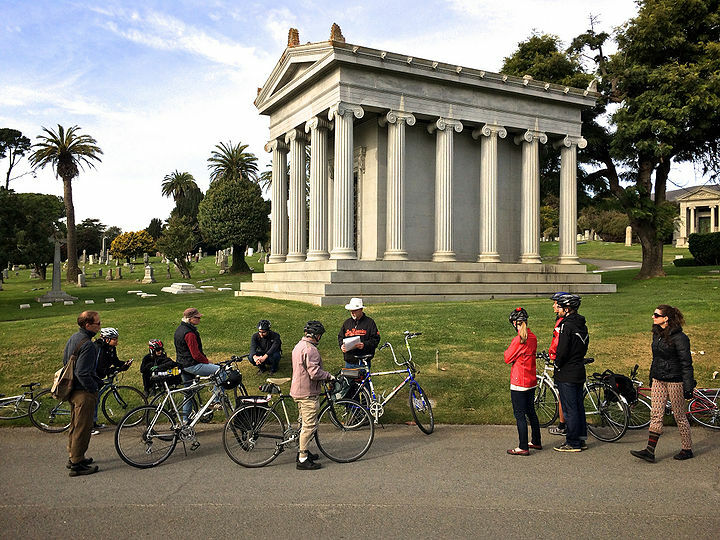 Shaping San Francisco Cemetery Bike Tour, Nov. 2013, seen here at the Hearst Mausoleum in the Cypress Lawn Cemetery.